Man how times change. UA was the biggest US carrier to Australia for years and now they're being overshadowed in LAX. UA remains the largest US carrier to Australia by a wide margin, even with these frequency reductions. This has been my thought this whole thread. While LAX is the dominant market from the US to Australia, and it may show that UA is struggling against the other carriers, they aren't doing too bad. I would guess that reducing LAX would cater more to O&D traffic, while UA flyers can connect daily to SYD and MEL through SFO. Also, LAX-MEL remains daily. I would much rather connect through SFO anyway, so it's not horrible. Between those options, and IAH, UA is not in too much trouble. There has been a reasonable capacity increase between Australia and North America in recent years. AC has gone from Daily to SYD only a few years ago to daily SYD and BNE and 4x wk MEL. UA will add MEL-SFO and has added IAH-SYD. QF has added 6 additional flights per week MEL-SFO and MEL-LAX. NZ has also added capacity and they are a key competitor on the Aus-USA routes. Some of this has come at the expense or in replacement of other services, but overall there has been capacity increase and a more diverse network. I think these changes reflect a slight rebalancing in the market to better reflect demand. That is a lot of recent capacity additions. NZ has also added quite a bit to North America over the last couple of years. If/when the QF/AA JV gets approved, this may happen at a bad time. There is so much speculation as to additional routes and added capacity. Rethinking this now, and with yields taking a hit, the last thing they are going to do is splash a whole bunch of new seats across the Pacific. I still believe we will see perhaps a transfer of capacity from QF to AA but I wouldn't expect a lot of new routes or a lot of new capacity being added. The UA move indicates the market is definitely needing adjusting. I think the most likely outcome of the JV will be transfer of some capacity from QF to AA. In particular the additional LAX frequencies from MEL/BNE. I believe as part of the JV application one of the concessions offered was the addition of 3 routes. Presumably QF MEL-SFO is one of them and perhaps some marginal increase on those AA services. Isn’t the Australian economy heading for a recession? It seems the housing market in AU is collapsing and economic confidence down (retail or car sales way down in January). That must have an impact in leisure trips to the US. Australia hasn't had a recession in 27 years. The real issue here appears to be the diminishing importance of LAX as the gateway to Australia from the US. It may be the largest in terms of service to Australia, but the addition of more flights to MEL, the introduction of more service from the US interior (DFW, IAH), and rising competition in SFO are making US-OZ service slightly less LAX centric than it has been. It is also really no different than some TATL routes from the East Coast to Europe that do not operate daily in the winter time, or in some cases at all. The market is somewhat seasonal. When you did not have AA in the market, UA only flying LAX/SFO-SYD, and QF on LAX and DFW only (they added back SFO just a few years ago and started MEL in October 2018 from SFO), there was enough to go around and maintain daily services year round. Not so, anymore. Aren’t AA and QF currently reapplying for their JV? I don’t think this helps their case. Welp, there went my flight on UA from SYD-LAX on 4/8. Got automatically rebooked through SFO. AA only downgauged their aircraft when QF took their code off AA's flight when their JV application was knocked back. Also, QF has been one daily on SYD-LAX for quite sometime now, however they've expanded via SFO. QF are only 9 weekly on SYD-LAX in December and January. I remember when QF used to be 3x some days of the week LAX-SYD. They flew the two evening flights and had a less than daily day flight too. I've flown both evening flights, but never got to fly the day flight. Sure, but that's a bit misleading given the antitrust immunized DLVA JV that's in place and the AAQF JV that's likely to be approved. Flight frequency (as opposed to seats or ASMs) is a poor metric when A380s are involved. Yes, but a couple of points to note. The AAQF JV isn't yet approved, and I believe (not 100% sure) that AA and QF don't code share exactly on the LAX-SYD routing). QF has the largest market share by number of seats since it flies LAX to SYD, MEL, BNE and from SFO to SYD and MEL, and DFW to SYD using A380s, 747-400s (SFO-SYD), and 787-9. DL and VS both fly 777s which have a higher seating capacity than the 787-9. Yes, but a couple of points to note. The AAQF JV isn't yet approved, and I believe (not 100% sure) that AA and QF don't code share exactly on the LAX-SYD routing). Right. I'm making the assumption that it will be. QF has the largest market share by number of seats since it flies LAX to SYD, MEL, BNE and from SFO to SYD and MEL, and DFW to SYD using A380s, 747-400s (SFO-SYD), and 787-9. DL and VS both fly 777s which have a higher seating capacity than the 787-9. I think the situation is a combination of the AU economy and frequency. There are more AU than US point of origin pax on the South Pacific routes. The AU dollar is now at 70 cents and yes there are some economic indicators suggesting the AU economy is going to retract- there is already a correction in SYD/MEL housing prices and new car sales are way down (taking into account the ghost cars the dealers are forced to register and sell as demos). The you have NZ's garbage yields in the AU market pushing prices down on all this new capacity- and their longhaul routes depend on it given their small home market. Having said that- yes there is less dependency on LAX even though it is the highest O&D by far. I guess UA have crunched the numbers and realised it's not worth staying in the SYD-LAX market daily with current yields. AA is in limbo until the new JV is signed and DL probably doesn't care as they only have one flight on their own metal to SYD- if they were really interested in this market they could launch LAX-BNE with a non LR 777 tomorrow. DL wouldn't need to fly LAX-BNE. Virgin Australia does it for them. Daily. Yes. It's listed as a Boeing 737-900. A 737-900 doesn't fly SFO-SYD. Actually, there are two "Christmas Islands". I was referring to Kiritimati, in the LIne Islands... which has also adopted the name. My point wasn't about VA doing the lion's share of flying with their JV, it referred to DL's actual physical presence in this market. So that's still 68 weekly flights from Australia just to LAX per week. Also noting that UA actually stepped up their LAX to Australia services when they decoupled Sydney and Melbourne which operated LAX-SYD-MEL-SYD-LAX on 744s. Overall, I get the idea that to be factually correct, we should count VA's seats when looking at DLs share in the market or revenue from Oz traffic (and to some degree the same for QF/AA), but I do think it is commendable that UA has been able to open so many routes to Oz without having a partner in the market, whether to fly JV flights with their metal, or to serve as feed on the other end. Just like UA has been able to do seemingly at HKG in flying non-stop fromi three hubs despite no partner and the presence of AA/CX; or even what they've been able to do in AMS vs. DL/KL, UA has been able to maintain a good solid presence in Oz by itself largely. They have myriad problems (some structural, some inherent, some due to bad choices) domestically, but UA has been very, very strong in the international game, even when forced to go at it solo. This has nothing to do with loosing marketshare when ticket prices are around $600 dollars roundtrip. Route decisions aren't made on cheapest fares - they're made on average fares. Any data on average fares LAX-SYD? UA still has lots of feed into LAX. What's the contribution of all the possible domestic segments to a LAX-SYD flight? Couldn't tell you what average fare data looks like but $600 fares on LAX-SYD used to be virtually unheard of...now they are common. That can't be an indicator that average fares on the route are high. QF has cut back, DL and Virgin haven't made any changes but they really don't have any smaller aircraft that could still operate the route daily, AA has downgauged to a 789 and UA cut back capacity by a third between the US and Australia. Sounds like all of the airlines are doing what they can to minimize losses while still maintaining daily flights between the US and Oz. is this $600 round trip? Yes. And then adding SYD-SFO and SYD-IAH and soon MEL-SFO. Perhaps the IAH add was just too much, especially at daily. I wonder if anyone else will flinch next? VA? DL? AA? QF? That Christmas Is is in the vicinity of Canton Is [as such things go in the South Pacific!] which used to be the PA, QF, BCPA & CP stop between HNL & NAN pre jets. I have not seen $A 600 round trip but I have seen $A 900 RT. If you are talking $US that's getting close to $US 600 at current exchange rates. I doubt VA will flinch, the only conceivable place they would have to use a freed up 777 would be to HKG, and that would be too many seats on that route, to then put an A330 back in the domestic market. If there's any further capacity reductions, I'd be tipping QF with down-gauging some flights to 787s during the "off-season" once the third tranch of 787s start arriving later in 2019/early 2020. VA is limited in their 77W fleet. If they are moving capacity elsewhere, it'll will be likely to be a part of the DL/VA JV (e.g DL taking over from VA on the MEL-LAX route for example, and moving the 5th aircraft elsewhere e.g HKG or even the slim chance of NRT if VA was to do a code-share deal with NH for example). The early tranche are accounted for if you consider that the 747s are being retired. You’re very unlikely to see a reduction from QF on SYD-LAX. Premium cabins are always completely full no matter what time of the year. Given UA has blinked, it’s even less likely now. You meant lose, not loose. They don’t, actually. A google search would of told you this. While VA is limited with the 77W HKG doesn't need it. As I have said previously a few months ago out of SYD-LAX, MEL-LAX and BNE-LAX, outside of peak times SYD-LAX loads suffer more than from MEL and BNE. I very much doubt VA would allow DL just to take over MEL-LAX. What VA needs to do and I hope with the new CEO we see some clarity on this is, replacing both the A332 and 77W with one widebody type. I believe the 787 is the aircraft to do this, the A350 is too much aircraft for A332 replacement. The 787 would allow frequency on LAX routes to be adjusted to seasonal demands. I would think 12-15 frames would be enough to cover domestic and international route needs. I think the writing is on the wall. United will most likely completely abandon the LAX-SYD route I hope they don't but United has pulled out of other major markets from LAX (PDX and MEX to name a few). United isn't as committed to LAX as American and Delta. So sad considering United used to be much more committed to LAX before the merger with Continental. Shouldn't we also take into account the traffic funneled via AKL? UA and NZ do have a JV, and since NZ has added service to IAH and ORD, and UA has resumed its year-round service to SFO, perhaps this reduction is just a case of US-Australia traffic becoming less LAX-SYD dependent. Nope, definitely $600USD. 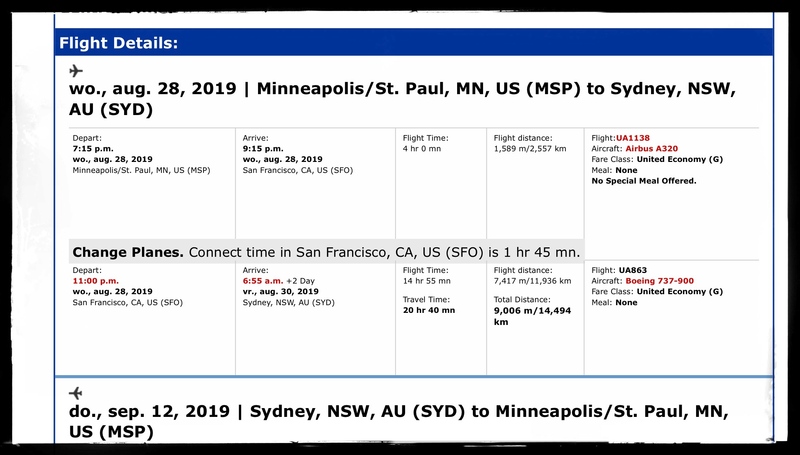 I booked SFO-SYD roundtrip for my brother on QF nonstop for $612, and roughly the same for myself LAX-SYD for travel in late March (coincidentally on the day UA's reduction goes into effect.) Saw them go as low as $576 at one point. The $576 fares were transient, but they hovered in the $600's for a good while. Last time I remember fares being this low was when DL and VA began LAX-SYD in 2009. Looks like the overcapacity today is finally exerting the same effect. United is holding their own at LAX. They are seemingly exiting a lot of larger markets, like LAX-PDX/DFW/MSP/MSY and using the aircraft on much smaller markets instead, like LAX-RDM/EUG/MFR/PSC/RAP/MSN. They want to use their LAX-based fleet on less competitive routes. It seems to me that United is still trying to figure out their overall strategy at LAX and they are experimenting on some of the less-competitive routes that I mentioned. I think United will eventually come around sometime sooner or later and re-open at least some of their larger market routes that had previously been cut, including long-haul routes as well, like LAX-SYD. Just read about it yesterday; too bad. I was looking forward to my flight SYD-IAH as being the longest I've been on. They now have changed it to a layover at LAX (UA842), and then with a 787-9 to IAH (UA2359). UA systems are a bit off, on the way there it shows an A320 to fly UA863. UA isn't what it once was in the LAX-SYD market. The competition & prices really do speak in addition to the in-flight service product? What are UA's LF's on LAX/IAH-SYD? Does NZ have higher Legs on their IAH-AKL flight? Not surprised about IAH-SYD. Economics on that kind of flight are hard even during peak season, much more so on the low season. Also IIRC they didn't have the best load factors on the route (I think it was around 70% RT), so it makes sense to cut back. I don't think the IAH-SYD flights were going to be Hot as Pancakes in the first place, I think the flights were put in to placate the "CO" side/MEL servci of the family. LAX and SFO had been the two hubs that sustained the SYD/MEL service. The IAH was just a "Me Too" flight. No airline is going to launch a flight simply to please employees. United saw connecting opportunities and they took their shot. I’m guessing it wasn’t as successful as they expected it. Overall, IAH-SYD has a higher probability of staying compared to LAX-SYD. You’re aware you’re bumping a nearly 3mo old thread?